Interest is rising in clean energy microgrids, especially within healthcare, higher education, government and business. All microgrids offer greater electric reliability. But the clean energy microgrid does more. It also reduces carbon emissions and helps organizations reach sustainability goals—an achievement increasingly valued by the healthcare community, business customers, government constituents, and college students, parents and donors. Clean energy microgrids produce electricity, and sometimes heat, using some combination of renewable energy, combined heat and power (CHP), and energy storage. In doing so, they are part of vibrant green trend sweeping the energy sector. In fact, renewable energy now provides almost one-fifth of U.S. electric generation, and federal analysts forecast that it will be the fastest growing source of electricity over the next two decades. Meanwhile, energy storage is expected to grow almost seven-fold in just five years, according to research firm IHS. 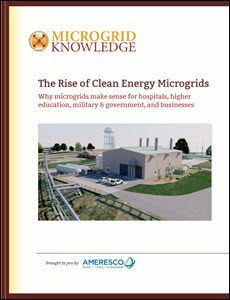 This report, brought to you by Ameresco, covers why microgrids make sense for today's hospitals, higher education institutions, military and government, and businesses.